Pope Francis has told Sicily's Mafia to abandon a life of crime and violence and stop being so selfish. He said they needed to stop thinking only of themselves and their money, saying the island needed 'men and women of love, not men and women of honour'. The pontiff appealed to the criminals during his visit to the home of a Palermo priest shot dead by Mafia hit men. Francis, in the Sicilian capital, said organised crime members - many of whom go to church and worship openly - 'cannot believe in God and be Mafiosi' at the same time. In his appeal, he referred to them as 'dear brothers and sisters'. He visited Palermo to commemorate Father Giuseppe 'Pino' Puglisi, a priest shot dead by Mafia hit men in 1993 because he challenged the organisation's control over one of the city's toughest neighbourhoods. Puglisi was killed on his 56th birthday during a bloody Mafia offensive against the state and anyone else who threatened the group's existence. Magistrates Giovanni Falcone and Paolo Borsellino were killed in twin bomb attacks in Palermo in 1992. 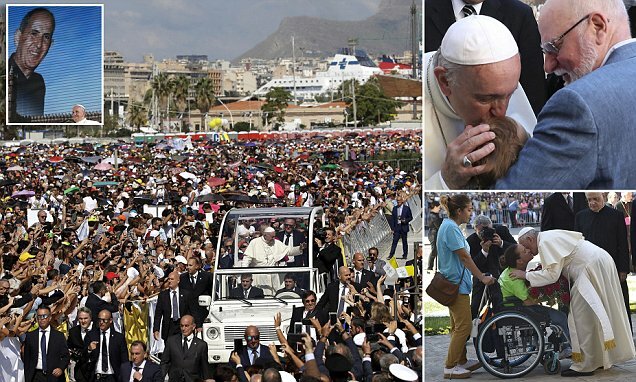 'A person who is a Mafioso does not live as a Christian because with his life he blasphemes against the name of God,' Francis said in the sermon of a Mass from some 80,000 people in the port area of the Sicilian capital.